I really wanted to work on the ring today, unfortunately we had a substitute teacher who really didn't see my vision. As I showed her the project I was working on, she continuously made comments on how I should have done this or that first, and that this or that wouldn't work. I don't mean to say she was negative, but she clearly couldn't grasp the design. So instead of confusing myself and the substitute, I decided to start on something else and save the ring for my instructor who can envision the finished ring as I do. 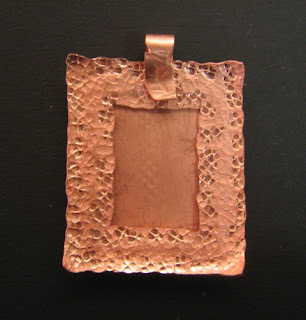 I encouraged the sub to go through my sketches, and we chose this picture frame pendant. I initially wanted to make this pendant with tubes and rivets so as to have a space in between to change out a small photo. 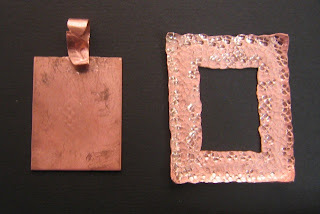 This version, however, will be a picture permanent in the frame, sandwiched between two pieces of copper, with a piece of thin plastic over the top of the picture. I plan to search for a picture to include in this frame tomorrow. I am thinking of an impressionistic floral painting or something like that. The side view... since this project needed to be formed and textured, I formed the sides slightly outward and the corners more so. The rivets will come into play once I find an appropriate image to incorporate. As it stands right now, I plan to rivet only the center of the two sides and the bottom. I initially wanted to rivet through the bail as well, but I formed the tip into a leaf and I realize that a rivet will just destroy the look of it. So, this is what I did today in class. 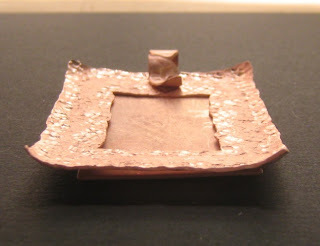 Next week I hope to finish this pendant and my ring that can't be done....yeah, we'll see. Too bad you had a sub, it takes a while to get to know some teachers and figure out what they have that you can learn from them, and how to learn it, lol! I like your frame, it was smart to distract her with your sketchbook. I really did distract her, and all in all we did have a good class. I learned more texturing tricks from her, and I am grateful for the experience, since I will be taking an intermediate/advanced class from her next semester. So we get to have a bit of history, that is good. I just can't wait till next saturday when I can finish my ring. As usual you pulled something positive from your class. smart to save the ring for your regular instructor...instructors didnt understand thomas edison or albert einstein either, so your in good company. keep up the good work. your work is great.